The listing of the church refers to the door as being c1100 and the Guide to St Peter’s quotes a date range of2 1080-90. Pevsner says The most interesting parts of the church are under the tower: a simply carved, tall W doorway which looks c1100 or a little later (shallow cut detail). It still has the Romanesque Door in it, quite impressive. The ironwork is chiefly three big horizontal iron bands penetrating the neck of C-straps, just like the pattern of Saxon brooches. This was written before Dr Jane Geddes published her book, Medieval Decorative Ironwork in England in 1999 in which she identifies the door as one of only five picture doors in the country and the ironwork as medieval. The ironwork is not Anglo Saxon or Viking as some sources claim. A dendrochronological analysis of the door has now been completed following a survey by Tree-Ring Services in October 2006. 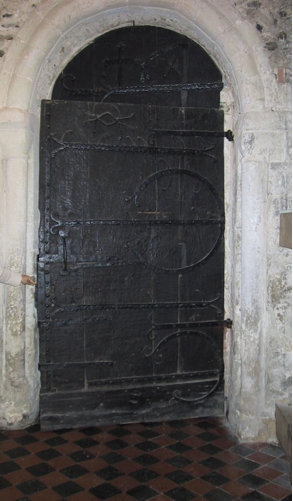 The report discloses that the construction of the door probably occurred at some time between 1106 and 1138 during the reign of Henry I (1100-1135) and that the four planks making up the door very likely came from a single tree which was over 270 years when felled. This dating is close to the previous estimate of 1080-90 which was presumably based on the position of the door within a Norman style archway and the door’s medieval ironwork. The age of the tree at felling means that it must have grown from an acorn which germinated in the reign of Egbert (802-39) before the time of Alfred the Great (871-901). It is wonderful to think of the door growing as a tree so long ago. Again the Guide to the church states, The door was made with a circular head but this had to be cut when the Zouche gallery was built against the west wall in the 17th century. This seems strange given that the door opens outwards at the present time. However an Edward Hassell water colour painted in 1830 shows the door opening inwards which would be logical since the door was originally the entrance to the church before the tower was built. This makes sense of the suggestion that the door was cut when the gallery was installed. There would have been no room for the door to open inwards through its whole length. It follows that the door must have been altered to open outwards some time after 1830 possibly when the church was extensively restored in 1886. The old oak door now cut is to be carefully grafted with a stiff ledge 41⁄2” X 3”of old wort oak on the inside moulded. The parts of door to be screwed on same. The ledge to be stained and oiled (WOKP/9/1 SHC). 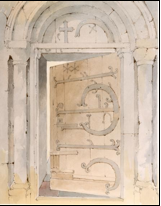 Apart from the door now being hung to open outwards, the door today closely resembles the image shown in the Edward Hassell water colour see right except that the present day iron hinges on the front by which the door is hung are not present in the Hassell painting. These are not of the same quality as the rest of the ironwork on the door and were probably made for the purpose. The Hassell water colour appears to show a frame in which the opening part of the door is set. Pyx door front ￼reflects over a century’s service as the entrance to the nave – the smooth surface of the Pyx door betrays its long life on the inside. The Pyx door has only one of its original iron straps whereas the Old Woking door retains its glorious C straps as well as is medieval iron work. The report on the Pyx door says The boards were cut from a single tree and the visible rings on them represent growth during the years from AD 924 to 1030. As the Old Woking door is said to have been constructed from a single tree which was over 270 years old when it was felled, it is likely that this tree was older than the source of the Pyx door. The fact that the door is built from five planks as opposed to the four planks of the Old Woking door may support this theory.